An intrinsic semiconductor is an undoped semiconductor. 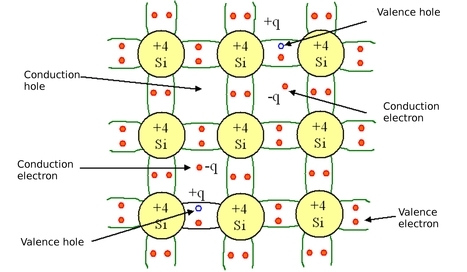 This means that holes in the valence band are vacancies created by electrons that have been thermally excited to the conduction band, as opposed to doped semiconductors where holes or electrons are supplied by a “foreign” atom acting as an impurity. Where is the normalized Planck constant (h=6.626.10-34Js) and mc (resp. mv) is the average effective mass of the conduction band (resp. of the valence band). For a direct gap semiconductor, mc (resp. mv) is the effective mass of an electron me (resp. a hole mh) in the crystal. The above-mentioned concept of effective mass allows considering electrons (and holes) inside the crystal as almost free particles, like free quasi-particles. The semiconductor then becomes an electron (and hole) gas, but in which electrons and holes have an effective mass which may be very different of the mass of the particle moving in free space. For example, for GaAs mc/m0=0,066 avec m0=0,911.10-30kg is the free electron mass. Where k=1,38.10-23 JK-1 is the Boltzmann constant, T the temperature and EF the Fermi energy, which is the chemical potential for semiconductors. The probability for a hole to occupy a level of energy E is simply given by 1-f(E) since a hole is by definition the absence of an electron. Where Nc et Nv are called the effective densities of states. They represent the density of “useful” states, at a given temperature T, in their respective energy band. Let's note that the product of the two densities turns out to be independent on the position of the Fermi level. This is still true even for extrinsic semiconductors (see below). It is known as the law of mass action since it resembles the law of mass action encountered in chemistry (for instance the auto-ionization equilibrium of water is governed by [H+][OH-]=Ke). Where ni is the density of intrinsic carriers (for Si at 300K, ni 1010cm-3). In figure 4 are graphically summarized the important points raised above for intrinsic semiconductors.